100% Cotton. Dinosaur Dance. A lovely bright fabric of 3" squares. 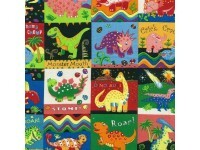 Each square has a dinosaur in it and a lot of the squares have writing such as "Stomp" "Chomp Chomp", "Rumble Roar". 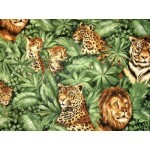 Has coordinating fabrics on cream and blue backrounds.